Well, hello there. The last time I posted I was talking about God’s fatherly love. Right after that I ran out on an errand and caught 5 minutes of a sermon about that exact issue. It took me this long to sit down and catch the whole thing, and I’m so glad I did. God definitely set it up so I would catch that as confirmation of that type of love. There was a ton of good stuff in it, but the part that goes with Fatherly love is that Christ experienced so much pain on earth, and not only was Jesus fully God, God is also the father who had to watch it. Something else I found very applicable to this situation is that Dr. Rogers mentioned when we have physical pain, our whole body compensates and comes to the rescue. Like if you break your arm your other arm and muscles help to let the bad one recover. I strongly believe that is going on with the body of believers (and tons of nonbelievers) helping our family right now. I have never seen a community reach out like this and it’s amazing. Romans 12:4-5 says, “Just as each of us has one body with any members, and these members do not all have the same function, so in Christ we who are many form one body, and each member belongs to all the others.” This is really big to me because I’ve been wondering why God is putting us on so many people’s hearts. There may be many other reasons, but demonstrating truth from the Word is a good one. It reminds me that the rest of it is true, too. I’ve said it before, but my family and I are so grateful for the outpouring of love and concern from everyone. Next to the stage 4 diagnosis it is the biggest surprise of my life. And it is definitely the best one. I’m so excited, I can’t sleep until I get this out. And yes, I do consider 9:35 bedtime these days. Anyway, I just had a serious breakthrough about the willing sacrifice issue I blogged about earlier. Such a huge weight has been lifted because I finally get it. ..
It’s not about cancer, it’s not about me, this is about God. Heb 11:1 says, “Now faith is being sure of what we hope for and certain of what we do not see.” If I have any faith at all, I will trust Him through this. I will follow Him. Willingly. With joy. No matter what the cost. God is supreme. He is the inventor of all things, and if He thinks it’s a good idea for me to go through this stage of cancer at this time of my life, I will go. With glee. He picked me for this job! He knows best. How arrogant of me to say what is good or bad, what should or shouldn’t be! How quickly I forgot all the amazing things He’s done for me, and stopped praising Him so I could complain about Him. To think basically that I am smarter than Him and my plan is better than His. How ridiculous and embarrassing. I thought about editing my last post to account for this breakthrough because it’s Christmas and no one probably read it yet anyway. But I want to be real, and I really was being that ungrateful and prideful for the past few weeks. That burden of stupidity is gone now though. I am relieved that I don’t have any say in who lives or dies. I don’t even have the burden of going through this on my own. I am not trudging alone to the grave, God is carrying me to the place I need to go. Deut 1:31 says “There you saw how the LORD your God carried you, as a father carries his son, all the way you went until you reached this place.” In His arms is exactly where I want and need to be. He is with us. He came to live among us, and left His Holy Spirit as our counselor, who gives us wisdom and understanding. These are things I need. I’m about to get pretty deep and possibly confusing. But I’ve been wrestling with this for weeks and feel like getting it out there. I feel that God is asking me to be a “willing” sacrifice for Him. The point of Jesus coming and dying for us was so He would be the sacrificial lamb, and He doesn’t require sacrifices now (Hebrews 10:5), so it’s a little unexpected. I’m thinking of it as not being required, just requested. Of course, anything He requests I will do my best to perform. I feel like He’s telling me this is an issue of getting my heart right. Not that I would try to die or stop trying to live, but I suppose more of a willingness to go through this no matter what the cost. Obviously, I don’t have a choice in whether I die from this disease, so I feel like I’m currently trudging along to the grave, hoping to get pulled out alive. And now I’m supposed to keep walking that way because He wants me to, or sort of because I want to do it for Him. Not because I have to. I want to want to please God. If I knew this experience would result in my healing–that I would live on earth and raise my girls–I would joyfully and willingly go through a short cancer/chemo trial for His purposes. But not knowing the exact purpose, and not knowing if I will live or die from it makes it really hard to do this joyously. I hate that my willingness to please God is still dependent on “if’s” and “buts”, and I guess that’s the evidence that my heart is wrong in the first place. If I didn’t have kids I’d die if that meant someone would turn to Christ and spend eternity in heaven. But what if the whole reason behind this cancer stuff is just to get some stranger to know more about Christ, and then they still reject Him? Do I want my children to grow up without their mom for a stranger’s missed opportunity? Nope. I just don’t. I’m trying though. It all looks like a non-issue on the surface, because I cannot control when I will die. God does that, and He controls or allows every issue on earth, whether it’s my advanced cancer or someone else’s stubbed toe. Below the surface, though, is a matter of the heart that I need to resolve. This is the anniversary of Jesus’ birth, and He struggled with the same thing when He asked God to take the cup from Him. It was much harder in that case, because Jesus had the power to actually stop what was going on, and couldn’t demonstrate it. Mine is a perceived control issue but I actually have no say in it. In the end, I trust God. I just need to put on my happy pants and push away the “if’s” and “but’s”. He has an awesome plan and I am still honored to be a part of it. I just wish it didn’t make me feel so nauseated! Ecc 3:11b-14 He has also set eternity in the human heart; yet no one can fathom what God has done from beginning to end.I know that there is nothing better for people than to be happy and to do good while they live. That each of them may eat and drink, and find satisfaction in all their toil—this is the gift of God. I know that everything God does will endure forever; nothing can be added to it and nothing taken from it. God does it so that people will fear him. Romans 12:1 And so, dear brothers and sisters, I plead with you to give your bodies to God because of all he has done for you. Let them be a living and holy sacrifice–the kind he will find acceptable. This is truly the way to worship him. All States Have Prayer Coverage! 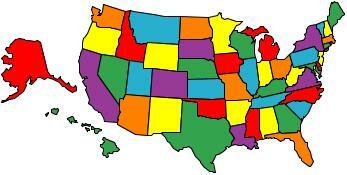 Thank-you all so much for your help finding people to pray for us in every single state. There are a ton of international pray-ers as well. I’ll paste the colored map below and am so very grateful. I know God hears all our prayers. But if you stay joined to me and my words remain in you, you may ask any request you like, and it will be granted. What in the world is God doing? The Bible is full of all these warnings about how believers on earth will be hated and all that. But in what should be the darkest, loneliest time of my life He is showing me nothing but love. Love through His people. Through people like you, who read this, stop me at stores, call me, leave or send me things. People who I know and maybe even moreso from those I don’t. When I first had children I thought I got a pretty good handle on God’s love. He loves us even more than we love our kids, and that amount is far beyond measure. I get that, cognitively. But it’s hard to process. Like right now, I feel like if I’m going to go through this storm, I should be isolated, miserable and despised. I should be feeling like Job when he’s lost it all. But instead I’ve never felt so complete. I am showered with blessings and feel so loved. What kind of storm is filled with love? But that’s what this is. A love storm. I have to remember this. To embrace it instead of questioning it. I don’t need to wonder about the ending, just to enjoy today.